Ann-Margaret with her beloved bike. 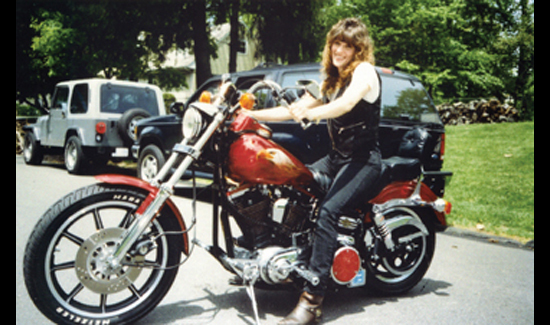 When she met her husband, Pete, they both rode Harleys. On their first date, they rode their bikes to Connecticut—in the rain. Ed. Note: Today, we continue with the gripping love story of Ann-Margaret Lyons and Pete Tetukevich (read Part I here), who met when they were both assigned to the NYPD’s Emergency Service Unit, the department’s 400-strong SWAT team. This chapter—from the pages of Brave Hearts: Extraordinary Stories of Pride, Pain, and Courage by American Police Beat publisher Cynthia Brown—focuses on the horrible crime Ann-Margaret dealt with just two weeks out of the Academy. Almost a decade later, Officer Ann-Margaret Lyons was on patrol hundreds of feet underground in the New York City subway system. She’d only been out of the Academy for two weeks and was happy to be finished with the seven-month long training. Lyons’ shift was eight in the evening to four in the morning, five days a week. Like all subway cops at that time, Ann-Margaret worked alone. A week before, someone had doused a token booth clerk with gasoline and set him on fire. The clerk was burned over eighty percent of his body. Despite the valiant efforts of the burn doctors, he died later that day. It was a particularly vicious crime and the department doubled the number of police officers patrolling the subways. Officers were instructed to spend their shifts riding the subway cars and walking through stations in hopes of spotting the criminal who killed the clerk. Around two in the morning Lyons was almost at the end of her shift. She was riding on a subway car in East New York near Kingston Avenue and the Eastern Parkway. Ann-Margaret Lyons was two weeks out of the Academy and had just celebrated her twenty first birthday. She had two suspects she was pretty certain had set a man on fire. She had the man who was on fire and another man screaming that the suspects had just robbed him. On top of all that, she was in a subway tunnel. Her radio wasn’t working and she had no way to call for backup. This time the boys followed the officer’s instructions, but it was still two against one. There was no way Lyons could get them in handcuffs with those odds. “Thank God they were cooperative with the gun pointed at them.” She tried her radio again and fortunately this time it worked. She described her position and the dispatcher told her to hold on. Backup was on the way. 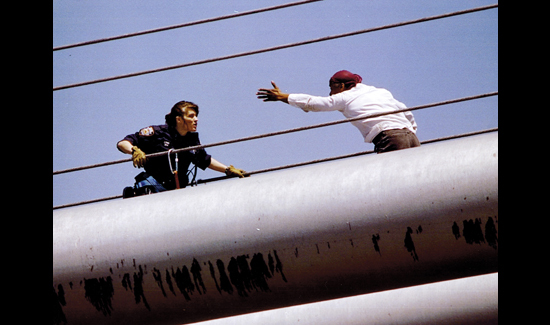 During her career with the NYPD, Ann-Margaret often found herself on top of the city’s highest bridges. Here, she’s atop the George Washington Bridge, trying desperately to keep a suicidal man from jumping. It took over an hour, but she was able to convince the man to let her put a lifeline on him and bring him down to safety. With her gun pointed at the two suspects with their hands spread up against the wall, she could look around to see what else was going on. It turned out the man, who appeared to be homeless and had been set on fire, put out the flames himself. His arms looked badly burned but he told Lyons he was taking off. Even when their shift has ended, cops are never really off duty. This was a reality Lyons experienced her first year on the job. It was four in the morning on a frigid January day. She was driving home after working a double shift of sixteen hours. “All I wanted to do was get home and go to bed,” she said. As she pulled out from the precinct parking lot in Brooklyn and headed towards home, something caught her eye. She pulled over to the side of the road to get a better look when she saw a building on fire. Ann-Margaret grabbed her radio and raced towards the flames. A small crowd had gathered in the street, but no one had thought to call the police or fire department. She knew she couldn’t wait for the fire department. She ran to the front door and was relieved when she found it open. She raced from floor to floor screaming, “Your building is on fire. You’ve got to get out.” She banged on doors. She kicked them in if there was no response. Within minutes, Officer Lyons was sure everyone was out of the building. By the time the firefighters arrived, the fire in the apartment building had spread to the lower floors. Her actions that night saved many lives and earned her a distinguished service award. John Wayne said, “Courage is being scared to death, but saddling up anyway.” He could have been talking about Ann-Margaret Lyons. She went on to earn her second award for meritorious service that same year, an honor almost unheard for a rookie cop.